El Nido is a first class municipality located in the province of Palawan in the Philippines and considered a top destination for tourists who enjoy island hopping. READ Phil resorts bag int’l travel awards. El Nido made it to the 2014 World Travel Awards. El Nido is a managed resource protected area and is known to be the best beach and island destination in the Philippines due to its natural splendor and ecosystem. Best beach destination in the Philippines. The island is located in Bacuit bay, which is a heavy marine reserve, at the northern most tip of mainland Palawan and has a land area of 465 square kilometers. The South China Sea is located at the west of the island. El Nido not only boasts of its white sand beaches but also its ageless high marble cliffs, crystal clear waters of its 50 beaches, enchanting lagoons with turquoise green water, caves leading to hidden beaches and a diverse variety of wildlife. The limestone cliffs were carved out naturally out of the thick coralline deposits formed over 250 million years ago. Commercial airlines fly 2 flights every day from Manila to Puerto Princesa city which is the capital of Palawan. 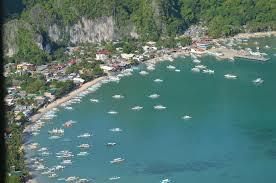 From there you can you can take hired vans or buses towards El Nido at a travel time of 5 to 7 hours. You can also travel directly by boat from Manila to El Nido. Activities that can be enjoyed within the island are cliff climbing, cave exploration, waterfalls sightseeing, kayaking and windsurfing. You can also hire a motorbike and explore the surrounding northern part of Palawan. Scuba diving is also a popular activity here which can be enjoyed in over 30 dive sites of varying levels and skills. Either a beginner or a diving expert will surely enjoy what the diving areas have to offer. The dry season in El Nido extends from November to May at temperatures of 30 degrees Centigrade. Christmas and The Holy Week are the best times to visit the island due to the good Philippine weather and festive mood.